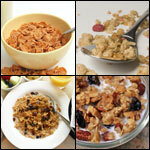 This recipe for Homemade Cereals was submitted by BethH on 2/10/2004. Click here to view the recipe. Really would love to know the carb count... can anyone figure it out? Does anybody know if I need to refrigerate this after I make it, so it'll stay fresh longer? Our body cannot process flax in its whole form, so, unless you grind the flax seed, you're not getting any of the great nutritional value. I would recommend grinding the flax (I do this in a coffee grinder, very easy) and adding at the end of cooking time (heat affects flax, as well). 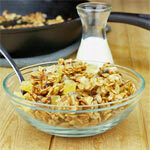 Great recipe - substituted pumpkin seeds for the walnuts and pecans and used almond slivers as well as whole almonds. Mmmmm... great with fresh fruit and dried. Next time, I will add the flax seed at the end of cooking as they burn fast. This stuff is gross. It looks like bugs and the flax seeds get all slimy when you try and eat it with milk. This one was a NO-GO for me. This is in Response to Mr. Guy. If you "knew" anything about how bad starch is for your overall health you would not have made the comment about butter as butter is not bad for you, but starch is! Would you add milk to it or just plain? I have been eating it plain but have no serving suggestions. Why don't you just eat healthy food and not care about the carb count. Who gives a toot about carbs? Just eat healthy and you'll be fine. Low carb doesn't always mean healthy, what about a stick of butter? Try doing without that. "Net Carbs" are carbohydrates minus the fiber. Protein is not subtracted from the carb count for the obvious reason it's a protein. Wow this is great. U gotta great try it. So... what is the correct carbs for one cup? You aren't figuring it out right, you should figure out net carbs and you minus fiber and protein (which is very high) off the carb count so its even better for you. I love this. It's great to have "cereal" in the morning when I can't deal with cooking eggs, etc. I have just about 1/2 cup of this with a little kefir milk and it holds me until lunchtime. In making this I substituted pecans for the walnuts (not a fan of walnuts) and didn't have chopped almonds on hand so used pine nuts. It was fabulous. Warning though: this does make a very big batch, so unless you have others who will want to help you eat it you might just want to make half. I made an entire batch and was eating it almost every day for several weeks. 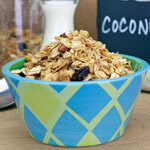 Ok so did the math and for ONE CUP of this granola its a whopping 937 calories but only 9.5 carbs. 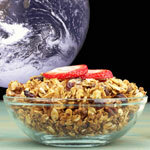 For 3/4 CUP of thie granola it is 702 CAloroes and 7.1 Carbs. For 1/2 Cup it is 468 Calories and 4.7 Carbs. Umm... anyone know the carbs on this? 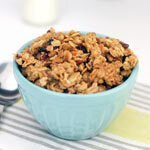 or does anyone actually have nutrition info (I try to watch calories and carbs) for a low carb granola recipe with flax seeds or meal? Thanks in advance! Couldn't find vanilla powder, so used regular vanilla and also changed the flax seed to flax meal. LOVED it!!! Makes a great change from eggs for us low carbers- would be nice to have the carbs per serving listed though. I think the serving size should be more like 1/4 cup, as 1 cup is over 1000 calories, a bit much for a breakfast or snack. It can get pretty dark pretty fast, so I'd recommend watching it closely for the last 10 minutes of the toasting time. We enjoyed this very much. Could not find vanilla powder so added the same amount of vanilla extract to the melted butter and that seemed to work. My husband, kids, and I love this recipe. We don't eat grains, so this was a great alternative. We love it on fruit with yogurt or coconut milk. My oldest son loves snacking on it plain. So net carbs are about 14 per serving. Not exactly low carb. It's possible it's all the nuts, since nuts do actually have carbs and are therefore not recommended for induction. It has 12 grams of carbs per serving not including the splenda. If you want to know how many carbs are in it, plug all of the ingrediants into FitDay.com and then divide it by how many servings there are. Be careful, fitday doesn't subtract fiber for net carbs, so if you're like me and go by net carbs, you have to do that yourself. HOW MANY CARBS ARE IN A SERVING AND WHAT IS THE SERVING SIZE? Delicious and extremely filling. Lots of calories, but doesn't affect my blood sugar at all (I'm diabetic). I skip the Splenda and just use cinammon. I make this, and like it, but I tweak it a bit. I cook it at 275-300 for a bit longer, I add 2-3 egg whites in the beginning to make it all stick, and spray a bit of oil and add the flax at the end (heat isnt good for flax seed) then cook for a minute or 2. I use half the flax, and less splenda. Very good in low carb milk for breakfast! Did i miss it or where is the info on how many carbs per serving?